Want gorgeous Christmas tree decorating ideas to make your tree stand out from the crowd? This year's Christmas tree decorating ideas, from Scandi understatement to bolder new Nordic to rainbow shades and kitsch craziness, are the best we've seen in all our years of trawling the Christmas shows (yes, they're a thing, and they happen in the heat of July, by the way). Here, we bring you just some of our very favourites. Find more Christmas ideas on our dedicated page. Cool-toned Christmas tree decorating schemes are bang on trend this season, and look particularly stunning with an all-over frosted artificial tree. If your living room decor is on the cool side, even better. This festive decorating scheme has been created with Isla Pre-lit Diamond Fir Tree and Jet tree decorations, both form John Lewis. Find more fab quality, convincing artificial Christmas trees in our buyer's guide. Love a dark, moody interior? Choosing gold baubles for your tree rather than co-ordinating dark-toned ones will make the room feel still more opulent – and, of course, they look amazing against the emerald green of a Christmas tree. Festive living room by Homesense. Be inspired by these dark, moody decorating schemes to transform your home. Kitsch is this season's biggest alternative Christmas tree decorating trend, so why not swap traditional baubles for something a bit more colourful and light-hearted? The kids will love them, too. George Home have nailed it this year with their Santa's Vacation collection. which is guaranteed to bring smiles to everyone's faces. So while we might encourage you to pick a co-ordinated colour scheme for an elegant tree, there are no actual rules that dictate that you have to do what we say. In fact, you can go to town, because the rainbow look for Christmas trees is a big trend this year. We love this rainbow decorating scheme by John Lewis – very colourful, but still smart. Keep the bottom of your tree from looking bare (that is, before all the presents are there) by decorating it with string lights and ornaments. This tree has been livened up with lights and light-up stars from Marks & Spencer. Prefer a Scandi decorating scheme? Do it a bit differently this time, with festive candle-shaped lights rather than baubles. The LED Connectable Christmas Tree Candle Lights are available from Lights4fun. Find more Scandi Christmas decorating ideas in our guide. Add a cheeky, fairy-tale element to your Christmas tree decorating scheme with animal-shaped decorations. We love the very sweet Three Felt Ladder Mice from Cox & Cox. Looking for more Christmas ideas for children? Don't miss our gift guides for boys and for girls. The Scandi trend for Christmas decorating is in full swing; want yours to be the very latest in Scandi style? Go new Nordic (yup, it's a new twist – still Scandi, but darker). Decorate your tree sparingly with a mixture of white, silver, and blue/green and you're there. This Scandi tree decorating scheme uses Nordic Lights baubles by Dunelm. Can't get enough of Scandi? 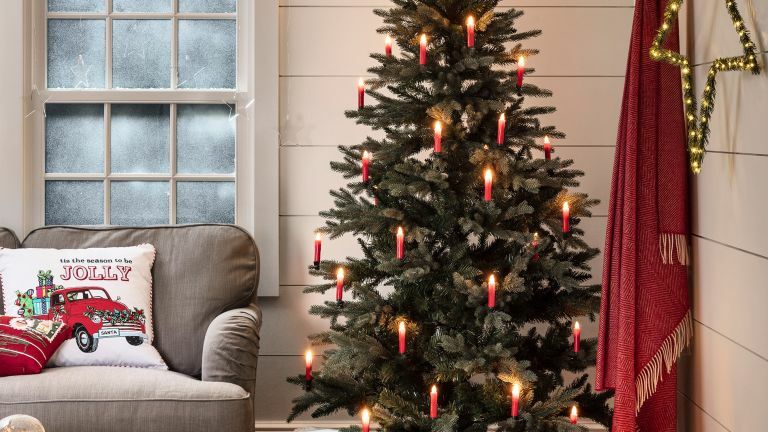 We have more Scandi Christmas decorating ideas. We're blaming all those lovely Instagram ladies and their gorgeous dark room schemes... If you want to keep it cool (see what we did there?) with a tree decorating scheme in shades of dark blue, look for baubles in a variety of shapes for added interest. We love the Aurora Collection from Wyevale Garden Centres. If you're after a traditional, cosy tree decorating scheme, take inspiration from the Highland Tales Christmas collection by Dobbies, complete with deer-shaped and tartan tree decs. And if you're feeling crafty, you could even make your own – got an old checked shirt that's doing nothing? Get your needle and thread ready. Want an instant update on the classic red Christmas tree decorating scheme? Mix up your traditional red baubles with cool blue-hued ones, and your tree will instantly look that little bit more exciting. This Christmas tree has been decorated with a mixture of blue and red Christmas baubles from Maisons du Monde. Check out more contemporary Christmas tree decorations. A different way of adding interest to your Christmas decorating scheme is by having two trees instead of one; go for two slim trees and decorate them slightly differently, though keeping the colour scheme similar. This almost (but not quite) symmetrical Christmas decorating scheme has been created using decorations from Melody Maison. Rich, jewelled tones are one of the leading Christmas tree decorating trends this season, and no wonder. The deep colours look beautiful when used for Christmas decorations. A jewel-toned Christmas tree scheme also will hold its own as part of a colourful room decor, preventing your tree from becoming lost. We love the way this mauve-toned living room has been enhanced with the Ruby range of Christmas decorations from John Lewis. Feel like something a bit different? Embrace the iridescent bauble trend and create your own space-themed decorating scheme. This delightfully otherworldly Christmas decorating scheme has been created with iridescent baubles from Asda's George Home.